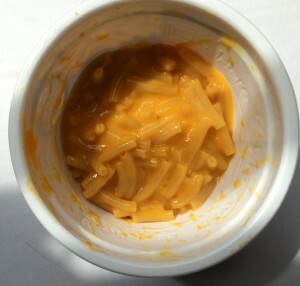 We’ve had a couple of mac & cheese showdowns here, Stouffer’s v. Michelina’s, Chef Boyardee v. Hormel, but haven’t done the microwave version that includes mixing the packet of orange powder. I love making baked macaroni & cheese from scratch, grating 2 or 3 kinds of cheese, panko crumbs, the whole deal, but there really is something awesome, almost memorizing, about the orange powder of the boxed mac and cheese I made as a kid. I would love watching it dissolve into the melted butter and pasta to be come the tangy, cheese sauce that went so well with watching The Dukes of Hazzard. We’ll be reviewing the boxed versions but couldn’t resist trying the microwave cups, just to know if these would be a good option for some reason. Ethan thought there was more cheese powder-to-pasta ratio than he remembered being in the boxed version (which he always thought should have have more cheese. The powder packet is mixed into the pasta once it’s cooked in the cup, no butter needed to add but some how the sauce is still kind of creamy. Personally, I thought it was a little “slick” feeling so I looked to see if there was xanthan or guar gum but there’s not, just modified food starch, so maybe that was it. Still the flavor was decent for orange powder and had the familiar tanginess from what I remember, not 100% but okay. B) Tastes like absolutely nothing, totally void of taste. It would seem obvious that Kraft would be the winner just because it’s a name brand but I have to say I’ve liked super market versions (that were probably the same thing in a different box) but this… They must call the brand “Double Takes” because you have to do that to make sure you actually ate something. Between the two of us the only adjective we could use to describe the taste was “nothing”. I guess it’s mildly impressive they managed to create something that tastes like actual nothing so, bravo on that Double Takes. Hilarious description of Double Takes! What a WASTE of money to buy these overpriced individual portions. You get nothing, and are creating a recycling nightmare for a quick lunch fix. Buy the box, make it at home, and put it in a reusable container to take to school or office!!!! 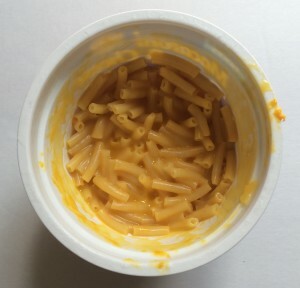 Used to work for a company that makes the cheese powder….reason Kraft is so much better is there is a lot more actual cheese in it (and higher quality cheese to boot). Only 1 other brand that we manufactured for was even remotely close to it in terms of quality and quantity of actual cheese.